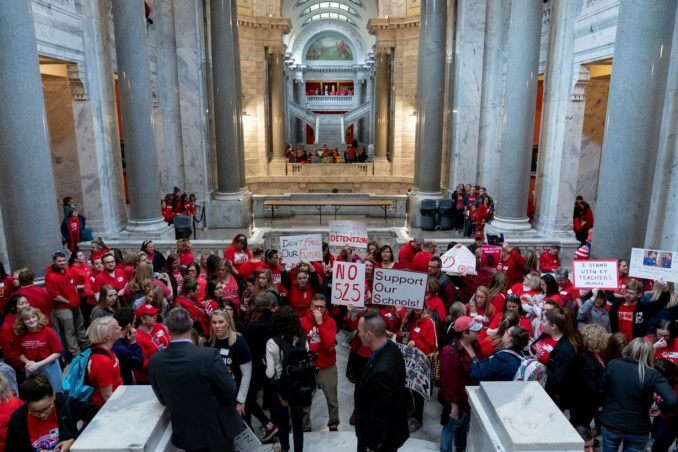 Ten Kentucky school districts have closed since Feb. 28 due to teacher absences, called “sickouts,” because teachers took sick days to protest at the state capitol in Frankfort. Jefferson County Public Schools, one of the largest U.S. school districts, with more than 98,000 students, including Louisville, shut down six times in two weeks. The Republican-dominated legislature, meeting since February, is considering proposals to change who manages the teachers’ underfunded pension fund and also to indirectly support private schools with tax credits — both strongly opposed by educators. The body has only one day left in session, March 28. Education Commissioner Wayne Lewis, who heads a board appointed by Republican Gov. Matt Bevin, announced March 15 that he would not rule out disciplining teachers who protest on sick days. He asked the 10 districts on March 14 for names of all teachers requesting sick days when districts were forced to close. This is the second year Kentucky teachers used sickouts to protest anti-education-worker legislation. A new coalition of Tennessee teachers hopes to seize the energy that inspired the wave of teacher strikes rocking the U.S. last year and continuing this year. TN Teachers United, formed using a Facebook questionnaire, was launched the week of March 3. The group initially garnered 200 members and hopes to expand to all 66,000 public teachers, as well as to retired teachers, parents, students and community members. Tennessee per-pupil funding remains the lowest in the South and is in the bottom half of U.S. funding. The TEA lost collective bargaining in 2011, and teacher strikes have been illegal since 1978. Tennessee teachers are leaving the profession in droves due to underfunding and damaging reforms, like teacher evaluations based on student testing. Gov. Bill Lee wants a voucher program to drain public schools and pay for private and charter schools. “We feel like public education is under attack,” organizer Tikeila Rucker told Chalkbeat on March 12. Because ILWU is dedicated to a strong public school system, once the strike was announced it began mobilizing members to attend community meetings and reach out to nearby unions. Its goal was to have experienced union members join the “adopt-a-school” program and help local schools during the strike. A total of 63 schools were supported by hundreds of ILWU members, past and present, and their families, as well as from the Marine Firemen, Steelworkers Union and numerous community groups. This meant picketing with teachers in the rain, bringing them food and ponchos, and showing “we have your back” with signs reading “The ILWU supports teachers.” ILWU members also collected and distributed food to help the 80 percent of low-income students who depend on school meals.